Warning: This is legacy content due to this product going towards EOL (End of Life). Depending on your local Toradex entity, there may be few to none of these products left for sale. 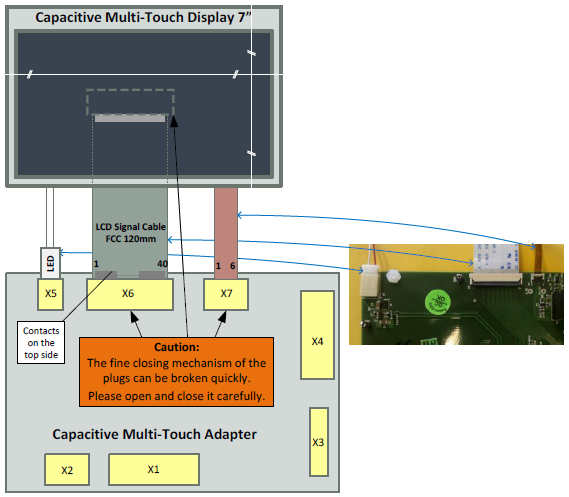 This article provides information on how to start working on the capacitive multi-touch display, which includes how to set up the hardware (wiring) and install the necessary WinCE drivers for a multi-touch demo. There are two sets of display kits "Capacitive Multi-Touch Display 7" and "Capacitive Multi-Touch Display 10" consisting of a Fusion 7" display touch and Fusion 10" display touch respectively and a capacitive multi-touch adapter. For more information on the topic, see Capacitive Multi-Touch Display. The images shown below are helpful in providing a general overview, but please note that the parts depicted in these images can change over time (color, etc.). In case of ambiguity, please consider the schematics and assembly drawing from Capacitive Multi-Touch Display page. Connect the chosen display and carrier board to the multi-touch adapter. Once the wiring is completed, you will need to install the driver. Click here to directly go to multi-touch driver. Note: X3 and X6 are the same type of connectors for FCC cable. Do not connect the flat cable from the carrier board to the X6 connector! If you do so, it will result in damaging either the adapter or the carrier board! Wiring of both the displays - Capacitive Multi-Touch Display 10" and Display 7" with capacitive multi-touch adapter board is different depending upon the type of display. This topic describes how to connect the Capacitive Multi-Touch Display 10” to the capacitive touch adapter. The LVDS LCD interface of the Display 10" can be connected to the X1 connector using the LVDS cable. The small, flat cable for the touch controller can be connected directly to the X2 connector (see the schematic diagram above). The FCC cable to the carrier board is connected to the X3 connector of the Capacitive Touch Adapter Board with Blue ribbon side up. Match the other end of the FCC cable's 1-40 pins properly to the respective carrier boards unified Interface display connector. 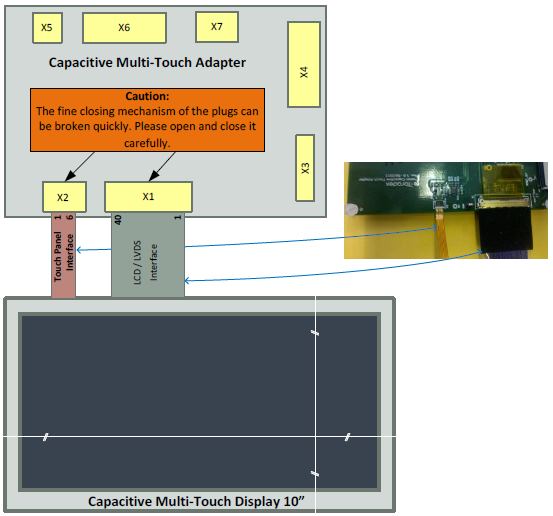 This topic describes how to connect the Capacitive Multi-Touch Display 7” to the capacitive touch adapter. The LCD interface of the Display 7” can be connected to the X6 connector using the FCC cable. Note: The blue ribbon side of the FCC cable should be UP on the Display and DOWN on the Capacitive Touch Adapter Board. The small, flat cable for the touch controller can be connected directly to the X7 connector (see the schematic diagram above). In the past, Toradex created custom capacitive touch drivers (single- or multi-touch) for every specific device and certain OS versions. Because there were no defined standards to connect capacitive touch devices, this resulted in a variety of touch drivers. The multi-touch solution from Toradex gives the customer the opportunity to write and maintain their own touch drivers with little effort. The capacitive multi-touch solution is a concept to generate a customized multi-touch driver for a particular touch controller very easily. For more information, see Capacitive Multi-Touch Solution. The setup program for the multi-touch solution will request to list the used display type and carrier board. It will then install all executable files and make the necessary modifications in the registry. Setup for Capacitive Multi-Touch Solution for WCE6/WEC7 modules. Setup for Capacitive Multi-Touch Solution for WEC2013 modules. Supports multi-touch, single-touch, and gestures. Information about the registry settings of the hardware adaption can be found on Capacitive Multi-Touch Solution. The Unified Multi-Touch driver is based on the example of a multi-touch driver from Microsoft. Therefore, information about the registry settings of the Unified multi-touch driver can be found on Capacitive Multi-Touch Solution. Information about the touch calibration can be found at the MSDN. NOTE: Do not forget to save the registry. The display should show the Windows CE desktop without any border, flicker, etc. Click here for more details including, checking the documents for general functionality, multi-touch hardware adaption fusion. In rare cases, if some part of the text on the Touch Display 10” is not readable, change the pixel clock polarity to zero. Click here to know more about it. In rare cases, if you experience I2C failures of Vybrid Modules with connected touch, reducing pull-up resistor value may be of valuable help. 1.8K pull-up can give the better result. For PXA Modules: Please press and hold the touch device till booting to RESET the inactive state. For more information, please refer this article. If the Touch reset pin is connected with GPIO 26, set the GPIO direction as output and level as 0 by using GPIO config block settings. For Tegra Modules: If you are adapting another touch device, please use library v2.1 or newer Windows CE Libraries and Code Samples. For Vybrid Modules: Use WinCE image v1.2 or newer images. For iMX6 Modules: When detecting the touch events, the mouse cursor will be visible in the Colibri and Apalis modules for every WinCE version. Currently, the display rotation is not working on Apalis iMX6 WinCE. The issue will be resolved in the 1.0 beta 5 release. It can be done with GPIO Config Tool. With this tool. the chosen SODIMM or MXM3 pin for the Interrupt can be monitored and the Reset pin can be set to high and low. Please check if the Reset pin is in its inactive state (level is 0) so that the touch controller of the display can run. Install the Unified multi-touch driver and control whether the driver is loaded at the startup of the module. Install the Hardware Adaption Fusion application and control whether the program is loaded at startup of the module. Check if the touch panel is working. Choose "No" to continue with the installation. If you need to switch between Tegra T20/T30 module and VF50/VF61 module options, then the directory "\FlashDisk\Autotun\" must be cleaned (rename and reset the module) before the directory or its containing files can be deleted. Our Embedded Linux BSP supports capacitive multi-touch screens in single-touch mode. However, while the lower stack (driver and X-Server) supports multi-touch, the desktop environment doesn't make use of it. Also, there is no gesture engine inside the driver or X-Server itself.